The Angeles Beach Club (also known as the ABC) is by far the best hotel available in Angeles City, Philippines. The ABC is very conveniently located on Don Juico Avenue, which is only a short walk from Fields Avenue, home to more go go bars than a guy could visit in a short vacation. There are plenty more bars right around the Angeles Beach Club and even more on side streets like Raymond, Santos, and further up on Perimeter Road. Also located nearby is the SM Clark Mall, which is a large modern mall (filled with shops, restaurants, a video arcade, a movie theatre and more) that can be quickly reached on foot or even more quickly reached via trike or one of the ABC’s cars. The ABC has a variety of different rooms available. They are all priced to reflect the top status of the Angeles Beach Club in the city. Very rarely will you find anything less than one hundred US dollars. Most times you will pay a lot more than that.The standard rate for the lowest priced room is 5350 pesos, which comes out to around 120 at current exchange rates. In my experience, hotels in Angeles tend to be priced higher than similar lodging in other nearby countries like Thailand. There are some budget options around, but they are very sorely lacking. On the plus side, Angeles City and the Philippines in general are pretty inexpensive places, whether you are purchasing food or heading out for a night on Walking Street. While the basic “Standard Suites” are very nice, and definitely enough to meet the needs of most single male travelers, some of the pricier options are simply fantastic. The Jacuzzi Suite is a great buy. Only a little more than the Standard, it includes a big jacuzzi bath for you and anyone who joins you in the room to splash around in. The jacuzzi even has a window in the front so you can see what’s going on under the water if you so desire. The options just get better from there. The New Millennium Standard Suites mix modern with classy elements and include a glass walled bathroom. The Beachfront Junior Suites include a desk which is great for getting work done or typing up reviews like these (though serious businessmen will probably want to opt for the Prime Minister Suite, which includes a full office). 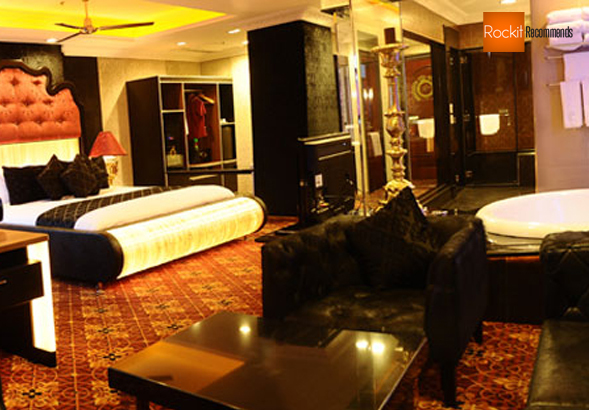 The Lifestyle Fiesta Suite is huge and includes its own living room, bar and a steam bath that can seat several people. The Party Fiesta Suite is similar but has a more open layout and features a bar with its own stage and pole. You might think there are a lot of options. The truth is I’ve only covered about half of them. Others include things like a 7 person party bed (imagine what kind of fun could take place there). Angeles Beach Club also operates the Fields Plaza Suites, which are new modern rooms that include all kinds of extras. I’ve stayed in several of the ABC and Fields Plaza Suites rooms. All were great. All included safes big enough to fit a laptop, adjustable lighting, comfortable beds and couches and black out curtains which work wonders when you want to sleep well into the day while on a tropical island. Wifi is of course free and strong in every place I’ve tried it. The ABC hotel also has two swimming pools, a wet/dry bar, a lounge, a spa, a gym, a barber shop (that does a surprisingly good cut), and a cafe that’s open all hours. A fleet of shuttle vehicles picks guests up at Clark Airport and takes them around town for free. Another nice touch is the on-site ATM machine, which is watched over by security guards. The Angeles Beach Club doesn’t shy away from the reputation of its home city. In fact, it warmly embraces it. Besides inviting guests to bring the party back to their rooms, they also regularly host a number of events like beauty pageants and pool parties that can get quite wild. Fear not if you aren’t a huge party animal though, as the rooms are private and insulated well enough to allow you to avoid anything you aren’t interested in. Take it from me, as much as I like to have fun I also need my beauty sleep. If it wasn’t possible to get in some solid winks at the ABC, I definitely wouldn’t recommend it. It’s hard for me to imagine a man who wouldn’t enjoy a stay at the Angeles Beach Club. It’s not the cheapest game in town but there’s a good reason for that; it’s the best thing going. 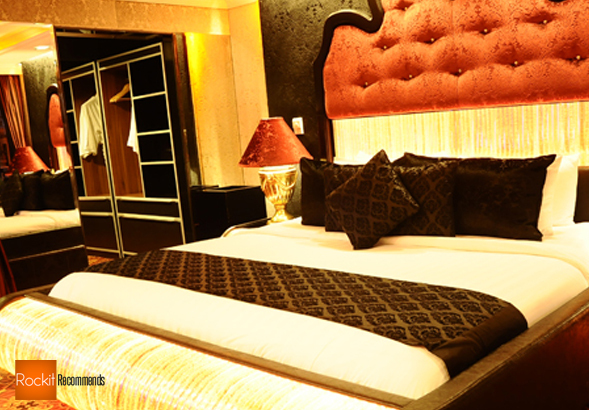 Book your room at the ABC online and get the best price possible. I’ve already written here about the best hotel in Angeles City and the worst. Rockit has been traveling internationally for years. As a lone male in the big bad world with plenty of time to waste, he was forced to seek out places to stay and people to have fun with. Benefit from his experience with the best and the worst, shared here with the readers of Rockit Recommends. Are there girls in the hotel ? there is no need to pick up the girl from outside ?can you book a room for short time? (1hour)what a bout lewis ground hotel? There are no working women in this or any other hotel in Angeles City. Some go in and out with customers all night but there are none who station there and wait for customers. Women looking for customers work in the bars or in some cases the streets. Cheers. Rockit Recommends Copyright © 2019.